The 2018 Threatened Species Children's Art competition opens for entries on June 4. The competition now has its own website and the entry forms are on the new site. More than 80% of Australia's native mammals and 90% of our native plants occur nowhere else on Earth. Australia is in the grip of an extinction crisis. Many of our unique and irreplaceable native animal species like the bilby, the northern quoll, the Leadbeaters possum, the Tasmanian devil, and even in some areas the koala have been driven to the brink. The Greater Glider (below) has just been listed as threatened. Nationally there are more than 1,800 Australian species and ecological communities at risk of extinction. 1000 species are at risk in NSW alone. There are many reasons for this crisis. Predation by feral animals like cats and foxes is one of them, but historically the main reason is loss of habitat due to logging for timber and low value products like woodchips, and clearing for agriculture, infrastructure and development. Climate change may also happen too quickly for some species to adapt and may make existing threats such as land clearance, farming and pollution worse. Many species of possums and birds require large old trees with hollows for breeding and shelter and these trees are increasingly in very short supply. The Swift Parrot among other species, is threatened with extinction for this reason. A certain level of biodiversity is necessary to keep our ecosystems healthy. This is because each species performs a different function within an ecosystem. Extinction has always occurred; the important thing today is that the rate has greatly accelerated. This increased rate of extinction has already led to unstable ecosystems as well as to the loss of potentially useful species. Australia's chief scientist has said that biodiversity is necessary to keep our ecosystems healthy. This is because each species performs a different function within an ecosystem. Extinction has always occurred; the important thing today is that the rate has greatly accelerated. This increased rate of extinction has already led to unstable ecosystems as well as to the loss of species. Some extinctions have been prevented, such as the Wollemi Pine in NSW, by the work of government agencies. The federal government views the approach as strategic, with resources prioritized so that some species survive while others are left to perish. It doesn't have to be this way. We do need a strong response to feral animals and weed infestations, but essentially, for species to survive their habitats need to be protected or restored. More resources are allocated to the eradication of feral animals. Offseting of habitat areas for mining and development is banned. Wednesday September 7, is National Threatened Species Day. 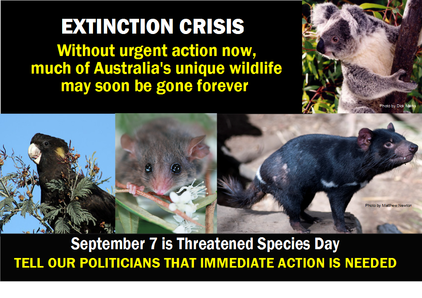 Let's get together and stand up for threatened species in NSW and throughout Australia. 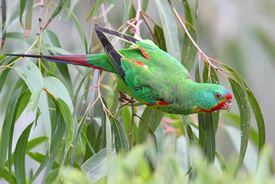 The Swift Parrot flies each year between Tasmania in the summer to southern NSW in the winter. It needs big old trees with hollows to nest and shelter. It's habitat in both states is being destroyed and degraded, especially by logging, and it is now endangered.